US Secretary of State Condoleezza Rice, a piano prodigy, may find her China tour like playing a complex piece of music, but if done properly the result will be harmonious. 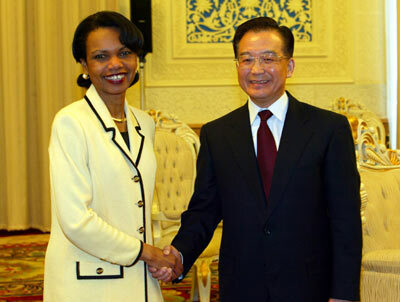 Talks with President Hu Jintao and Premier Wen Jiabao yesterday made a good start. Opinions on various topics, including the Taiwan question, Sino-US trade disputes, intellectual property rights protection, Korean Peninsula nuclear stand-off discussions and the World Trade Organization's Doha Round of market-opening talks, were exchanged frankly. Lingering in the background is the approval by China's top legislature of the Anti-Secession Law which opposes "Taiwan independence secessionists." In yesterday's separate meetings with Rice, both Hu and Wen stressed that the Anti-Secession Law aims to curb "Taiwan independence forces" and the law is conducive to stability and the development of relations between Taiwan and the mainland, and will also help maintain peace and development in the Asia-Pacific region. Both leaders said the "secessionist activities" of the "Taiwan independence forces" have posed the biggest threat to peace and stability across the Straits, expressing their hope that the US will understand, respect and support China's legislative action. Hu told the visiting secretary of state he hoped the United States will "see clearly the nature and harm of 'Taiwan independence secessionist forces' and their activities." Rice replied yesterday that it is in the US interest to maintain tranquillity across the Taiwan Straits and solve the Taiwan question peacefully, and that the United States will make efforts to that end. Rice said the US Government's position on pursuing the one-China policy and abiding by the three US-China joint communiques will not change, according to a Chinese Foreign Ministry spokesman. During her meeting with Hu, Rice said the US Government attaches great importance to developing US-China constructive and co-operative ties, and that people around the world are watching the "remarkable transformation" that is going on in China. 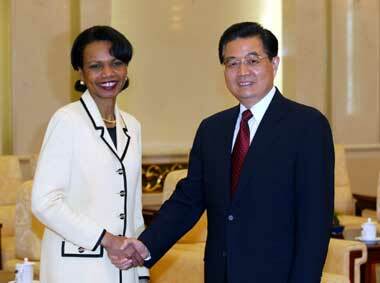 She said the United States is ready to join hands with China in exploring new fields for co-operation. On the bilateral trade disputes, Wen said China and the United States should take each other's concerns into consideration and handle conflicts in trade co-operation to achieve a win-win situation. He said economic and trade co-operation is an important part of China-US relations and that the two sides should further improve current bilateral co-ordination mechanisms, based on the principles of equality, mutual benefit and development. Wen said China and the United States maintain a generally good relationship and have forged fruitful co-operation in various fields, noting that bilateral ties could be furthered in US President Bush's second term given that the two sides will handle the relationship from a strategic and long-term perspective. Beijing, the host of the three rounds of the Six-Party Talks, reiterated yesterday that China will continue to push forward the Six-Party Talks based upon its long-consistent position of sticking to the direction of seeking a peaceful solution through dialogue, with the goal of denuclearizing the peninsula. Hu said China is willing to work with all concerned parties, including the United States, to resume the talks soon. Rice highly appreciated China's role in the Six-Party Talks which involved Beijing, Pyongyang, Washington, Seoul, Moscow and Tokyo, noting that the United States believes the Six-Party Talks is the best way to resolve the question. Rice arrived in Beijing yesterday afternoon. It is her first trip to China since she became the top American diplomat in January. China is the last leg of Rice's Asian tour, which has already taken her to India, Pakistan, Afghanistan, Japan and the Republic of Korea.